London design crowd was able to experience an extreme and vibrant design competition last Friday @ Village Underground. 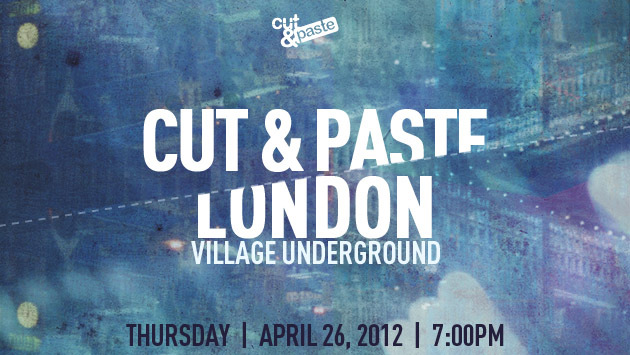 Cut&Paste was in the house ! I got to the event a bit early just after stopping at a nearby pub for a cold pint. It was the first time at Village Underground and I must say that I really dig the place. Great for music gigs and a perfect fit for Cut&Paste setup. Nice big screens allowed us to see the team’s design screens and one displayed the event real-time video feed. We had to warm up with a drink before the thing started. Soon enough the host, D.ablo started the show. The three-rounded team competition had 3 teams of 2D/3D designers ready for the challenge. First team was composed of Yeen Phong Trinh & Sylwia Bernatowicz, the second team had Colin Bigelow & Jay Harwood, and the third team was pairing Pavel Ivanov & Stefano Ottaviano. Make sure to click and check their profiles and their work online. Each round lasted around 20 minutes. The first round was about the concept of the design, 2D mood board/collage works in a speedy fashion. The works were good, although I wasn’t terribly impressed with the output of this round. The following are the final works published in the Cut&Paste page. After this one, we took the change to sketch and make some draws at the “Design for Clean Water” corner, powered by Adobe and Charity Water. The second round was far more exciting. The best 3D Model created in 20 minutes. The tool of choice? Maya (my favourite 3D tool by the way and the one used when I worked developing video games). I must say that here was were the magic happened. The tool is awesome, but everyone demonstrated against-the-clock amazing skills. My favourite was definitely the Dubstep monster having a blast as playing with London City, work from team 3, Pavel & Stefano. Check it out ! Round three was complicated by social-network voted constrains, while teams needed to complete their masterpieces and present a styleframe. Although I had to leave before the event ended, I know that Steve West was declared the motion/animation champion of the night. Check the other animation works presented ! The event, the urban vibe, the place and the setup were great and the mix worked out very well for the teams, the organizers and the crowd itself. You can follow Cut&Paste and keep an eye on the upcoming world events. The music, provided by Kay Suzuki was punchy and inspiring. The works were outstanding! It was a really good experience with a good mix of arts, music and technology. I hope that Cut&Paste continues the work and keep the gigs alive all over the world, and maybe in the future, evolve to encompass not only design, but application development and user experience competitions ! Congratulations to the winner team Colin Bigelow and Jay Harwood, well deserved.